WESTERVILLE, Ohio, Nov. 28, 2018 /PRNewswire/ — Each year, the Association for Financial Counseling and Planning Education® (AFCPE®) recognizes the outstanding accomplishments of its diverse and inclusive community of financial professionals. Award winners are peer-nominated and go through a rigorous peer-reviewed application process. “This year’s awards ceremony was incredibly special, as we celebrated AFCPE’s 35th anniversary and 25 years of the AFC® certification. Every year I am inspired by the work that is being done in our field. These professionals are elevating the field through innovation, expertise, leadership, mentorship, and action,” said AFCPE Executive Director, Rebecca Wiggins. Setting the Standard Award: Bureau of Consumer Financial Protection for the innovative national Financial Coaching Initiative. The program trained sixty (60) professionals to become AFC® (Accredited Financial Counselor®) and FFC® (Financial Fitness Coach) professionals. The Financial Coaches were placed in sites across the country to focus on serving veterans and economically vulnerable communities. The program data has shown tremendous results with 84% of active clients seeing improvements in their financial situation, including enhanced money management, increased savings, lowered debt levels, and improved credit scores. Additionally, an astounding 93% of clients have either established, made progress on, or completed their goals. Distinguished Fellow Award: Madeleine Greene, AFC® maintains the highest professional and ethical standards and is tireless in advancing the profession. As a military financial counselor, she has developed programs used by counselors around the world. This award recognizes her lasting contributions to AFCPE and the field. Mary Ellen Edmondson Educator of the Year Award: Holly Chase, CFP®, Pennsylvania Housing Finance Agency delivers financial education in a variety of settings and programs, focused on at-risk populations. She has developed a variety of adult financial education programs and materials, including the Capital Region Ex-Offender Support Coalition Reentry Financial Toolkit. Outstanding Educational Program: The Personal Financial Planning (PFI) Program at Texas Tech University was launched in the spring of 2013 with a vision by design – “All Texas Tech students are financially literate.” The PFI mission has three key foundational elements, the “3 E’s” – encouragement, engagement, and evaluation. The program impacts approximately 3,000 students per academic year and has witnessed 300 students declaring a personal finance minor. Outstanding Financial Counseling or Planning Center: Utah Valley University Money Management Resource Centerwas established in 2015 with the mission to help students stay in school, graduate with minimal debt, and learn sound financial skills for the future. In the 2017-2018 academic year, the center’s volunteer Financial Coaches provided more than 6,000 students help, guidance, and encouragement to solve money troubles, answer money questions, and broaden finance knowledge and skills. Outstanding Consumer Financial Information: Nothing Funny About Money is an NPR affiliated radio show co-hosted by Matt Goren, CFP® and Michael G. Thomas, AFC® reaching an audience of 20,000 listeners. The show puts a light-hearted spin on an otherwise scary topic: money. Outstanding Research Journal Article of the Year: D. Allen Ammerman, West Texas A&M University & Maurice MacDonald, Kansas State University: Future Orientation and Household Financial Asset Liquidity. 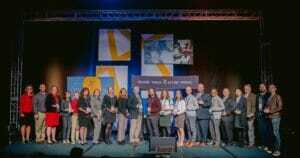 AFCPE award winners were honored in a ceremony at the 2018 AFCPE Symposium. AFCPE® ensures the highest integrity of the financial counseling profession by certifying, connecting, and supporting diverse professionals. Our comprehensive certification programs represent the gold standard for financial counseling, coaching, and education, including the AFC® (Accredited Financial Counselor®) certification which is accredited by NCCA and nationally recognized by BCFP and DoD. Learn more: www.afcpe.org.